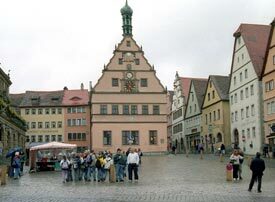 ABOVE: Tourists congregate in the Markplatz to watch the doors of the town clock open on the Ratstrinkstube (City Councilors' Tavern) in the center of the photo. Rathaus (Town Hall): After you've visited the tourist office on the main floor, you can look around the interior of this building, which was built and enlarged over a 300-year period from around 1250. A staircase leads to an observation gallery in the tower, where you can look over the town's rooftops. The Historical Archways museum and dungeons (entrance in courtyard) are a popular tourist attraction. The walls. Allow two to three hours for a walk along the medieval walls that surround Rothenburg's historic center. You'll enjoy great views of the city's rooftops and the surrounding countryside, and you can climb down along the way to admire the city's gates and other fortifications. A full tour requires 3.4 km (2.1 miles) of walking. The walkway has railings and is mostly level, but you'll need to watch your head in sections with low roofs and overhangs. Be sure to visit the Jakobskirche or St. Jakob's Church, the largest of Rothenburg's churches, which--along with the Rathaus--was the focal point of the Free Imperial City of Rothenburg during the Middle Ages. This Lutheran church is famous for its two altars, one of which--the Heilige Blut or Holy Blood Altar--is a remarkable piece of woodcarving that was built to house a capsule containing what is said to be three drops of Christ's blood. The Jakobskirche is also noted for its organ, and organ concerts take place twice a week during summer.